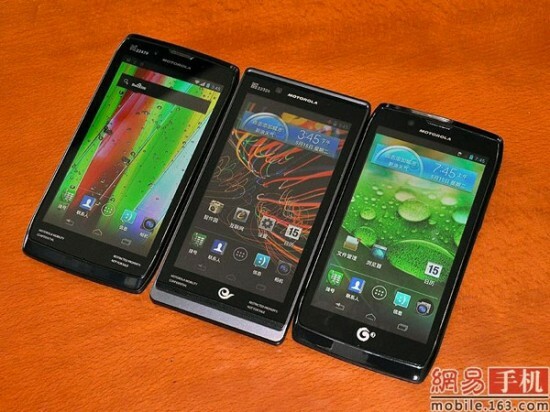 Motorola recently showed off three RAZR-esque new smartphone designs destined for China. The XT885, XT889, and MT887 will land at China Unicom, China Telecom, and China Mobile respectively, but will feature largely the same specs aside from radio configurations. Notable is the presence of Ice Cream Sandwich and the absence of physical Android buttons, eschewing the older Motorola style for something a bit more in line with Google’s current vision. Otherwise you will find a 1.2GHz dual-core processor, 8MP camera, and 4,3-inch qHD display. The three phones will debut in China on June 2nd, but might hint at what to expect from the upcoming Droid Fighter rumored for Verizon, particularly the M887 (far right in the above photo). That device has yet to be officially announced, but it should be coming sooner rather than later.